Although the growth of Firefox has stagnated a bit lately due to the increasing competition from rival browsers, it’s still one of the biggest success stories in the history of the Internet and has the second-largest user base of any web browser. Firefox has a widespread global user base, but we wanted to find out where it is most common, or another way of looking at it: how are the Firefox users distributed? Luckily for the curious, Mozilla has a page that shows continuously updated download stats for the latest major version of Firefox. This is currently Firefox 3.6, which went live on January 21 this year. 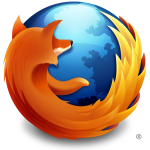 All numbers in this article are therefore for Firefox 3.6. Before we head on to the charts, here is a brief summary of what we found out. Top 5 countries in terms of downloads: United States, Germany, Poland, Russia and Brazil. Top 5 countries (out of the ones with 1M+ downloads) when you count downloads per Internet user, i.e. “popularity”: Finland, Poland, Romania, Germany and Australia. The United States accounts for 15.7% of all Firefox 3.6 downloads. Germany accounts for 9.2%. The data was collected this Monday. We thought that was worth mentioning since it’s a moving target as downloads keep ticking. It’s important to note that download numbers will not be equal to user numbers (those are not available). That said, the download numbers will give us a very good indication of where Firefox is used the most. As you can see, the United States and Germany are way ahead of the other countries when it comes to downloads. One reason for this is that these countries have very large Internet populations. The United States has 239 million Internet users, and Germany has 65 million. As you will see here below, though, Firefox is much more popular in Germany than it is in the Unites States. If you take the number of Internet users per country into account, you can find out the relative popularity of Firefox in each country. We essentially looked at downloads per Internet user, but to make the numbers a bit easier to digest, the chart shows how many Firefox 3.6 downloads there have been for every 1,000 Internet users each country has. The higher the number, the more popular Firefox is. 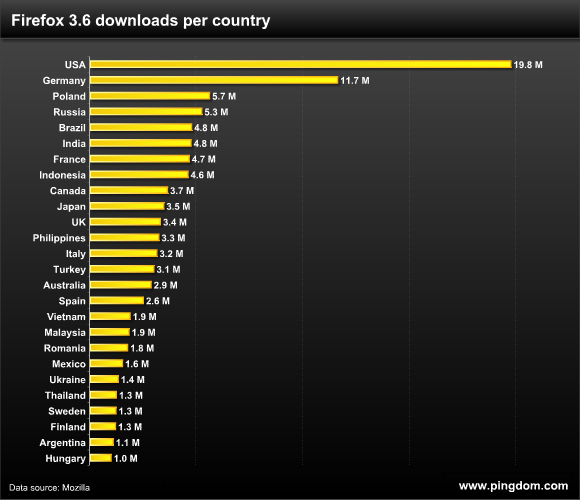 We only included countries that have more than 1 million Firefox downloads, just like in the previous chart. So, although the United States accounts for the highest number of Firefox downloads by far, when you take its size into consideration, the actual penetration is much lower than in many other countries. 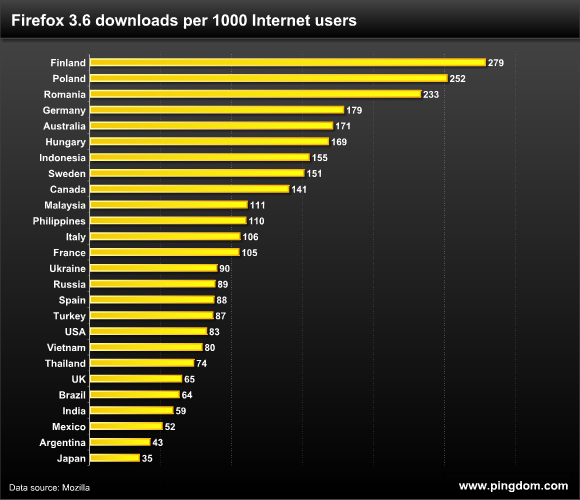 If Firefox were as popular in the United States as it is in Finland, US downloads would have more than tripled. Since we looked at the latest version of Firefox, what you see in this article is an up-to-date view of which countries are the big Firefox users of the world right now. We hope you found this little study interesting. Data source: Firefox download numbers from Mozilla. Why do downloads matter? What matters is usage. I’m surprised China is not on the list? I really like opera as a browser, but it does not support Roboform as external password manager which is very important to me (tons of different logins and passwords) – i know opera has the “Wand” thingy, but roboform offers more options i use every day. Google chrome is neat, but i would only install it for my parents or people who never upgrade since chrome already takes care of that quietly in the background.